University of Georgia's famous mascot began over 60 years ago with a bulldog named Uga. His descendants and name continue the tradition today. In 1956 Frank "Sonny" Seiler was a law student at the University of Georgia (UGA). He married that year and the couple was given a white English bulldog as a wedding gift. He took the dog to the first football game of the season and the head coach asked Seiler if his bulldog could be the school's mascot. Seiler agreed and a fellow student suggested naming the mascot Uga. 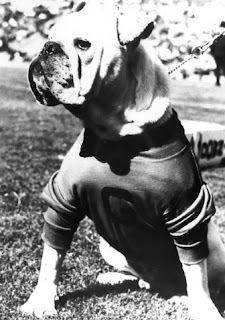 Uga (Hood's Ole Dan), the grandson of a bulldog that accompanied the Georgia football team to its Rose Bowl victory in 1943, was born on December 2, 1955. He was the University's mascot for ten years. According to Seiler, his wife made Uga's red jersey using a kid's t-shirt, and she had to make quite a few of them. "During the early games in Athens, especially the hot ones before he had a dog house, the large green hedges that surround Sanford Stadium afforded welcomed shade in the heat of battle. Unfortunately, the hedges constantly tore these jerseys and new ones had to be made." Uga retired in 1966 and died peacefully on November 9, 1967 while sleeping in the sun in the Seiler's backyard in Savannah. Since Uga I, nine Ugas followed - all descendants of Uga I and all owned by the Seiler family. All Ugas who passed away are buried in marble vaults near the main entrance at the southwest corner of Sanford Stadium. Epitaphs to the dogs are inscribed in bronze, and before each home game, flowers and gifts are placed on their graves. The epitaph for Uga I is "DAMN GOOD DOG", the words the whole stand at the stadium shouted when his retirement was announced. When the US had the famous Lassie capturing the hearts of children and adults alike, Canada had the Littlest Hobo. 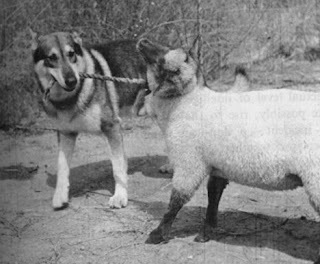 London in the 1958 film The Littlest Hobo, sparing a boy's beloved lamb from slaughter. London, a German shepherd with "reverse mask" markings (where areas on the dog that are normally dark are lighter in color) was owned by Charles Eisenmann. Eisenmann, a professional baseball player and dog trainer, named his dog after the city he was stationed at during the second world war. London was allowed to travel with the team during Eisenmann's baseball days and even provided entertainment to the fans. He would bow to the crowd, bring equipment to the players and run the bases. 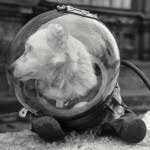 London appeared in Life magazine, and it was this article that got him a starring role in the US film The Littlest Hobo. The film, released in 1958, inspired the Canadian television series (also named The Littlest Hobo) that aired in 1963 for three seasons and was later revived in 1979 for six seasons. London and other dogs trained by Eisenmann played the part of the stray dog who traveled around helping others. 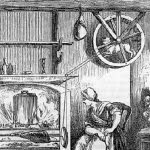 The name London was always credited as the star. The show appeared in over 40 countries, and guest stars of the show included well known actors such as DeForest Kelley, Leslie Nielsen and Mike Myers. London starred in three other films: My Dog, Buddy, The Marks of Distinction, and Just Between Us. 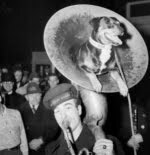 He was also featured in the book London: The Dog Who Made The Team. One writer described London as "the smartest dog that ever lived." Eisenmann, who preferred the word educating than training, taught London and his other dogs to understand three languages (English, German and French) as well as over 1,500 words. 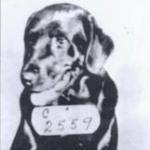 Grigio, described by many as a German shepherd-looking dog, would appear out of nowhere to protect Father Bosco from the anti-clerical factions in Italy during the 19th century. 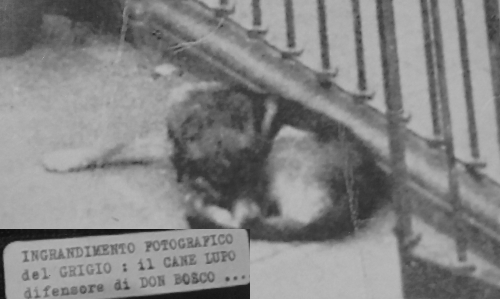 "Photographic enlargement of the grey wolf defender dog of Don Bosco"
John Bosco (1815-1888), popularly known as Don Bosco, was an Italian Roman Catholic priest - and declared a Saint some 40 years after his death. The good priest devoted his life to helping the disadvantaged youth, and was hated by many evil people who wanted him dead. One dark evening in 1852 as Father Bosco walked through the deserted streets of Turin, in northern Italy, a big grey dog approached him. At first the priest was scared but quickly realized the dog was friendly as he gently greeted him with a wagging tail. The dog walked alongside Father Bosco and when they arrived at the gate to his home the dog trotted away. That was the first of many encounters the two had when the priest would walk at night. The dog, who Father Bosco named Grigio (the Italian word for grey), would appear out of nowhere then disappear when the priest safely reached his destination. On two occassions Grigio fought off attackers by knocking them to the ground, and on another occasion the dog's fierce look and savage growls were enough to scare a mob of assailants away. 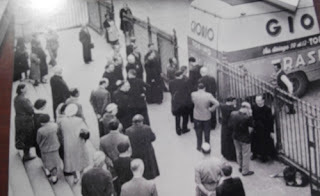 One night Father Bosco was determined to go out to attend to an urgent matter despite his mother's pleas to stay home. As the priest approached his gate he saw Grigio lying in front of it. He was happy to see the dog thinking he would follow him but Grigio would not budge or let Father Bosco go pass him. The priest's mother told him if he wasn't going to listen to her he should at least listen to the dog, who had more sense than him. Father Bosco stayed and about 15 minutes later he learned that some dangerous men were waiting down the road to kill him. As long as the persecution lasted Grigio was there to protect Father Bosco and when the danger passed he stopped coming. For years Grigio was not seen, until one night in 1866 when the priest went to visit a friend. 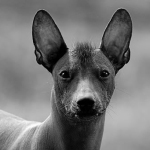 As he walked down the dark road he remembered a couple of guard dogs were close by and wished Grigio was with him. At once the big grey dog appeared at his side. They headed to his friend's farmhouse and when the two guard dogs came after them Grigio scared them away. They made it to the friend's house safely and Grigio laid in a corner of the room while the priest and his friend dined. Later, when Father Bosco turned around to offer Grigio some food the dog was no longer there. This time his disappearing act was not just trotting away, he left a home with the door and windows shut. This was the last encounter Father Bosco had with Grigio. When Father Bosco was asked to give an opinion on the nature of the grey dog "...he admitted that the dog was a creature worthy of note in his life. Although saying that the dog was an angel would have certainly made ​​people laugh, nevertheless he had to admit that he was not a common dog. Don Bosco often thought about the origin of that dog and he admitted that he had been a true gift from Providence." 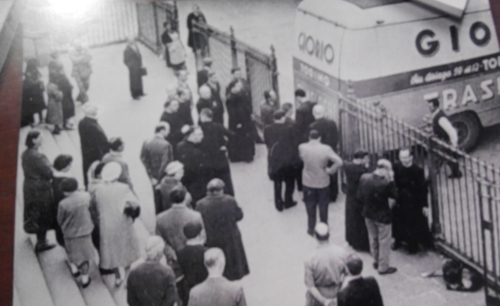 Almost a hundred years after Father Bosco's last encounter with Grigio a dog fitting the description of Grigio was spotted outside a church where Bosco's casket laid. According to Bro. Renato Celato, the dog somehow managed to get inside the locked church and was crouched under the casket. When the casket was transported to another destination the dog was seen following the van for several miles before disappearing.